For 30 years we have worked to preserve and keep Everhart Park beautiful. With your memberships last year, we planted over 20 trees in the park and mulched them to protect them from the mowers, planted a new liriope bed, worked with the Borough to trim trees, and stewarded the Little Free Library. The park just keeps getting better and better. We have new committees to study new playground configurations and the installation of a labyrinth in the park. We applied for and received a grant from West Chester Universityto map the park. Please consider an Active Household Membership for $20/yr or the Guilt-Free Household Membership for $50/yr. No other park has such diverse use as Everhart Park... quinceanos, yoga, Frisbee tournaments, dog walking, anniversary parties, wedding and family photo shoots, birthday parties, family and holiday picnics, the children's summer park program, Shakespeare in the Park and three major borough events: May Day, Turk's Head and the Easter Egg hunt. Support a beautiful resource right here in the Borough's backyard. To restore Everhart's Grove to its past glory, while incorporating the new uses it provides and to encourage and build-up neighborhood support for and pride in the Park. FRIENDS OF EVERHART PARK, established in 1989, was formed to preserve and restore Everhart Park to its historic appearance. Through fundraising, volunteer work days, and advocacy, the Friends of Everhart Park has restored the radiating park paths, restored the gazebo, reconstructed the rustic footbridge, restored the Children’s Summer House and planted some 300 trees and shrubs. Build shed in the Park for FOEP tools. DONE! EVERHART PARK is a 10-acre grove of hardwood trees and open fields that was originally part of the large Everhart Farm. The parcel was given to the Borough by the Everhart family in 1905. 1828 – William S. Everhart purchases a 102 acre tract of land that includes the present park from William Wollerton. 1840-61 – The park area is used for outdoor political rallies, abolitionist and temperance meetings, and camp revivals. Area used as a Civil War camp to train the First West Chester Volunteer Regiment. 1904-05 – On November 17, 1905, Dr. Isaiah Everhart, nephew of the deceased William S. Everhart, donates Everhart Grove to the Borough of West Chester. 1906 – Oglesby Paul, a Philadelphia landscape designer “prepares plans” for improvements to the grove. The layout of radiating paths, gazebo, and footbridge are attributed to Oglesby Paul, and were probably scaled back by the County Engineer, who was consulted on the design. 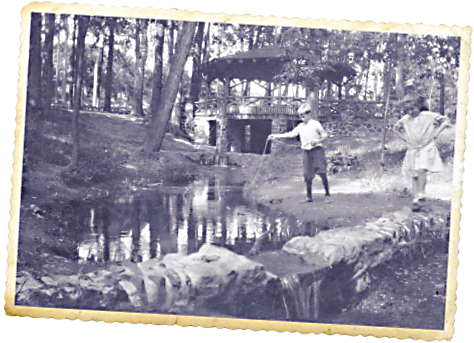 1908 – A rustic gazebo similar to the gazebo in Marshall Square Park is constructed over the stream to serve as a bridge and meeting place. Mr Farra reports that there are over 500 trees in the grove (L 10/27/08). This gazebo remains to this day. 1909 – The radiating walks and a pond are constructed, and the Everhart fountain is moved to the pond from downtown Market Street. (DLN 2/7/1980). 1920 – Construction of the Barnard Street entrance, including stone piers and bronze plaque. West Chester Band concerts begin in the gazebo and continue until 1940. 1943 – The pond is drained. 1987 – Severe summer storm destroys dozens of virgin oaks and other hardwood trees in the park. 1989 – Friends of Everhart Park (FOEP) forms in response to a planned utility pipeline that would have eliminated nearly 20 ancient hardwoods. 1990 – FOEP begins a 3-year project to clear walks and stone gutters. 1994 – FOEP assists the Borough in the reconstruction of the stone foundations of the Gazebo. “Jack’s Entrance” is built to honor a great neighbor and friend of the park, Jack Dautle. 1997 – FOEP installs the Horace Pippen Bench to honor a nationally recognized West Chester artist who was acclaimed only after his death. 2000-08 – FOEP funds or assists in the funding of several projects: planting of the wetlands with the BVA and Hillsdale School volunteers, reconstruction of the footbridge, memorial tree marker program, rehabilitation of the Children’s Summer House, reroofing of the Gazebo, and repaving of the Activity Court with pervious paving.